If you are in the market for a new stairlift for your home or office, it helps to know the costs before you start shopping. Providing a high quality chair lift in a residential or commercial setting is a great idea but you need to know the price range ahead of time so you can budget accordingly to find the model that is right for your needs. 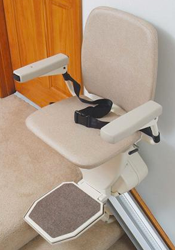 When you purchase a stairlift from Indy Stair Lifts you’ll find a number of high quality new chair lifts that have affordable financing options that will allow you to install a new stairlift quickly in your home or office. Whether you need an indoor or outdoor stairlift, a chair lift for the home or office or a stair lift that is designed for curved staircases, Indy Stair Lifts has the best selection of comfortable and affordable stair lifts. We understand how difficult life can be when recovering from surgery, dealing with a debilitating condition due to an illness or just adapting to aging which is why we offer a great selection of practical stairlifts at affordable prices to make navigating a home or office easier. At Indy Stair Lifts we offer financing options that could get you a brand new residential or commercial stairlift for as little as $89/month with a fixed interest loan. New stairlift prices can range from high to low and it’s important to find the chair lift that not only meets your budget but also has the features you need to make moving between floors easy and smooth. Contact Indy Stair Lifts today to get started on purchasing a new residential or commercial stair lift. With a fantastic selection of high quality chair lifts you’ll have no trouble finding a model that is right for you and we’ll work with you to find a financing option that meets your budget.